As a little kid I loved playing Ghosts n Goblins and even were a bit afraid of the Zombies. But even more I hated the flying devil past the first hill, as I died there almost every time. As far as I can remember I never made it past the first level as a kid but I still loved the game and tried again and again. 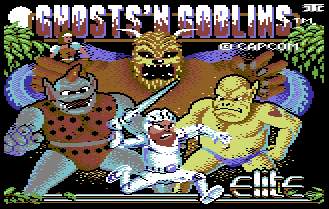 This was probably because of the nice looking pixels that Chris Butler made for his conversion of Ghosts n Goblins for the C64 or because of the really nice soundtrack by Mark Cooksey. And yes, after 2 decades I used an emulator to finally beat what I never did as a kid. While doing so I also created level maps of all the levels that you can see here now. May they be helpful for you when you are about to do somethink alike. Enjoy! All 4 levels and the end can be viewed here, just click on the shrunk previewimage!